we present Sensei Nathan Scarano. Wealth of knowledge and experience from top instructor known worldwide will be presented in this seminar at The Syosset Martial Arts Center. Please fill the form attached and submit as soon as possible. Nathan Scarano started training in Shotokan Karate in 1979 in Riverside, California, and currently holds the rank of 6th Dan with the AJKA-I. Over the years he captained many U.S Karate Teams overseas, cap- turing gold in team and individual kumite events. Notably, at the 2004 and 2006 prestigious Euro Cup, he won individual ippon kumite titles and was named best contestant in 2006. Since retiring from competition in 2007, he coached AJKA-I U.S. Karate teams that successfully competed in Canada, Hungary and Ger- many. 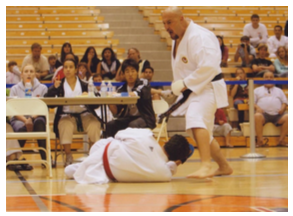 Sensei Scarano is best known for his sweeping capabilities in which competitors have experienced and spectators have witnessed around the world. His specialty has been featured in many martial arts pub- lications including Shotokan Karate Magazine and Masters Magazine. Sensei Scarano is also a Southern California law enforcement officer with 19 years experience. He has worked many intense assignments including a multi-agency regional gang task force, a fugitive apprehension team and a criminal intelligence unit. He is a certified instructor that teaches firearms, active shooter, defen- sive tactics, field operational tactics, gangs, radio communication, and search and seizure. He has earned nu- merous accolades including statewide Officer of the Year honors, Distinguished Service honors, and the Medal of Valor. I, the undersigned do herby volunteer my application for the attendance and participation in the 2017 Shotokan Masters Seminar Series, and do hereby assume full responsibility for all injuries, damages, or losses that I may sustain or incur, if any, while attending/participating. I do hereby waive all claims against AJKA-I, Syosset martial Arts Center, individually or otherwise, for any claims or injuries I may sustain. I fully understand that any medical treatment given to me will be first aid type only. I certify that I am in good health and without injuries or physical disabilities. I consent that any pictures furnished by me or taken of me in connection with the seminar can be used for publicity, promotion, or television showing and waive compensation in regard thereto. I further agree to conduct myself with decorum in the spirit of Karate-Do. © 2017 AJKA of NY.